We love hearing about your road trips, so when we heard from the VW camper van Syncro owners group, the Syncronauts, we were inspired. They are an eclectic bunch of campers, off-roaders, ex military as well as a number of 9 to 5’ers and weekend warriors. The Syncronauts like nothing more than to play in their 4 by 4’s. We heard directly from the group that the Syncro is an awesome vehicle that everyone should have a go in. They are very capable off-road vehicles and perfect for driving in the snow, negotiating the mud and tackling minor flooding. 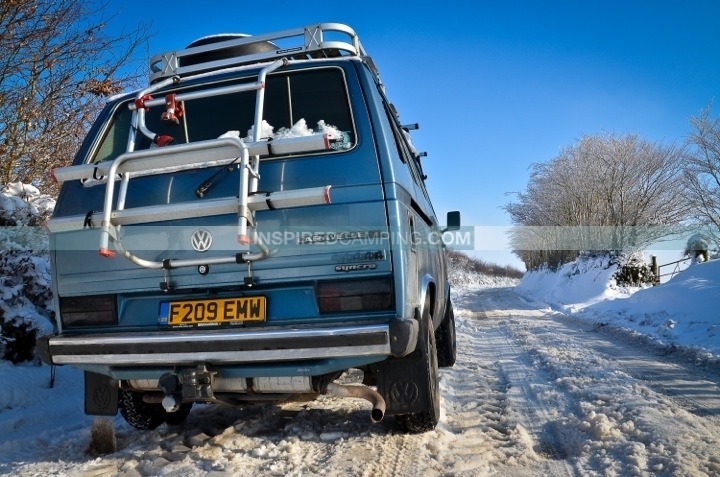 1987 VW Caravelle Syncro 4 by 4; 2.1 Petrol; fitted with a de-coupler to alternate between 2 and 4 wheel drive; front and rear diff. locks; LPG conversion; swivel Captain Seats; 12 volt lighting and leisure battery; full width rock and roll bed; and a kitchen pod to cook up a storm! The owner, Greg, tells us that if you want one of these mean machines you need to have a knowledgeable team to help you maintain it. They use Coast VW here in good old Devon, who also have a few available to buy and convert. Want a successful glamping business?